Regardless of your feelings on "the issue" at hand, one cannot deny the history of domesticated chickens. 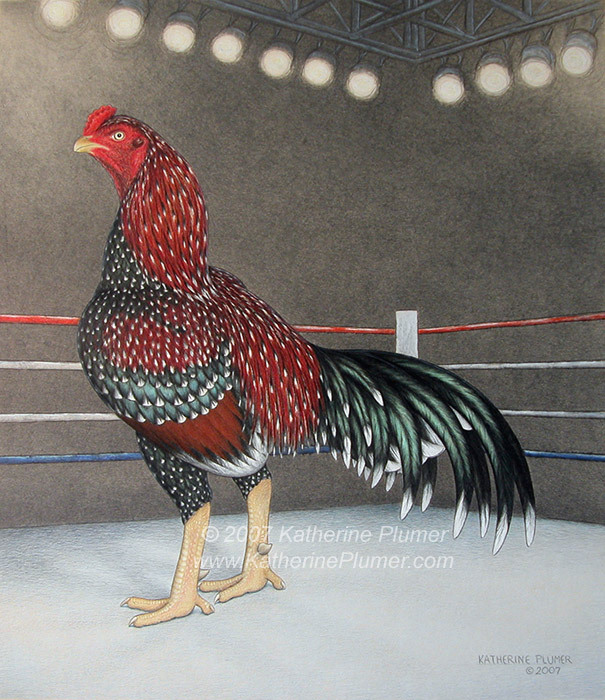 Chickens were domesticated thousands of years ago for fighting. This bird is an Aseel (or Asil), a game bird of Indian origin, found throughout the world today. This drawing is an idea I'd had in mind for a while, but it took a while for the concept to fully form and for me to decide what would be the ideal bird to fit the background. I wanted a bird that would be appealing to as many people as possible: to fanciers, to game enthusiasts, and to people who don't know anything about chickens other than they come in some pretty fantastic colors. Why Spangled? It presented a challenge, and that was part of the appeal, I wanted to show off what I could do, and I know people like this color, and my first chickens ever were Spangled Old English Game Bantams, so I must admit I have a soft spot for Spangled birds!